The theory of human motivation (Maslow, 1943), better known as Maslow’s hierarchy of needs, is considered a cornerstone of understanding human motivation. Even today it continues to be used as a foundation for other theories of motivation and behavior. A positive learning environment is one of the most critical components of a skills-based health education classroom. A positive learning environment is created when you value participatory teaching and learning and when there is trust and rapport among students and between yourself and students. Criteria for a Personalized Professional Development Plan: 1. Identify learning goals. Similar to asking your students to set a goal during a goal-setting unit, identify two to four learning goals per year that you would like to achieve. 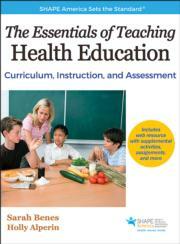 The Essentials of Teaching Health Education presents a skills-based approach to teaching K-12 health education that prepares students for success in the 21st century. This practical text is written by seasoned and highly credentialed authors with experience in both university and K-12 settings. It provides all you need to build, teach and assess a health education program that will help your students become health-literate individuals, develop the 21st-century skills they need for success in college and in their careers, and maintain or improve health outcomes. With its comprehensive content and robust ancillaries, The Essentials of Teaching Health Education delivers a well-rounded curriculum that will prepare current and future teachers for success. Textbook for undergraduate-level health education teaching methods courses. Reference for K-12 administrators and teachers.